At Shudhvi we believe in the power of nature and each of our products has been developed after extensive reasearch on Ayurvedic, Herbal and other Natural Ingredients. Each product is made with high quality natural ingredients and rich moisturizing oils, in small batches using cold process method to ensure effectiveness of the end product. All our ingredients are freshly sourced exclusively from indegenous regions and made using traditional processes to retain their natural medicinal properties. We do not use artificial colours, fragrance, preservatives or additives like parabens etc., and is absolutely safe. Our products can be used by people of all ages and skin types. These pure and natural handmade soaps are made in a cold process method with a combination of pure natural oils and skin benefitting ingredients that helps in improving your complexion with every wash and keeping the skin bright, supple, moisturized and radiant all day. Shudhvi beauty products are formulated with all natural base and exclusive herbal extracts to give your skin total care and all the nutrients needed to keep it healthy inside out and free from any skin problems. Shudhvi hair care products are fast acting and are formulated with extracts from various raw oils and freshly sourced ingredients, that give complete solution to hair related problems and helps in drastically improving hair growth and texture. 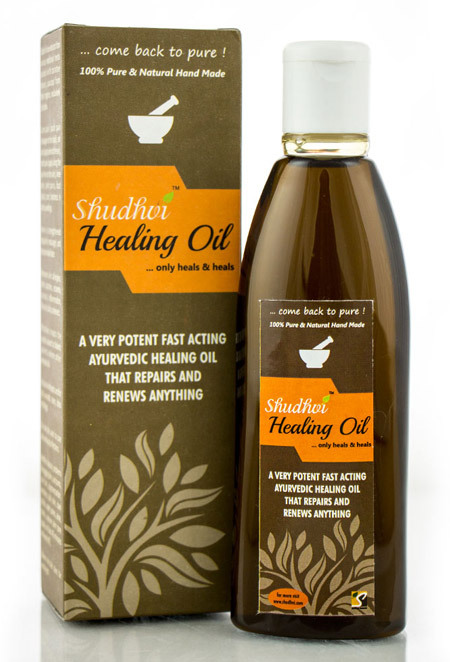 A very Potent Fast acting ayurvedic healing oil that repairs and renews anything. Cures pain, back pain, tooth pain, knee pain, joint pains, foot cracks, corn, hardness in palms, swellings. Bone is strengthened and fractures heal faster. Removes skin allergies, white patches, eczema, psoriasis, inflammation, flaky skin, rashes etc. Effectively treats the wounds caused to diabetic patients where other remedies fail.